What a way to end the Fyxation Open Omnium! We just got back from Chicago and it's taken us a few days to dig out but we wanted to put this race recap up here on the site. We are always humbled by the response we get from the riders, sponsors and fans every year that we host our growing fixed gear Omnium. While our series doesn't attract the media hype and rider numbers of some other races, the Fyxation Open is a special event that we are honored to host. We just wanted to say a quick thanks to everyone involved. Now for the recap. Chicago was the final stop in the 2018 Fyxation Open Omnium and after 3 exciting races in Milwaukee in June, we rolled down to Chicago for the series finale. First time Fyxation Open Sponsor, Chrome Industries, stepped up huge this year as a sponsor and in addition to giving out primes and podium prizes, they hosted a Fyxation Open pre-party at their Wicker Park Chicago Hub on the Saturday before our race. Chrome really knows how to throw a party and they hosted about 100 people at their Chrome Hub that included Goose Island beer, Pizza from a local pizzeria and Goldsprints. The party was a huge success and we all raced bikes head to head using their Goldsprints set up until about 9PM, when they shut things down so we could all get some rest for the Fyxation Open in the morning. At the party Chrome showed us the custom bags they designed for the Fyxation Open Omnium winners and we were blown away by the design. 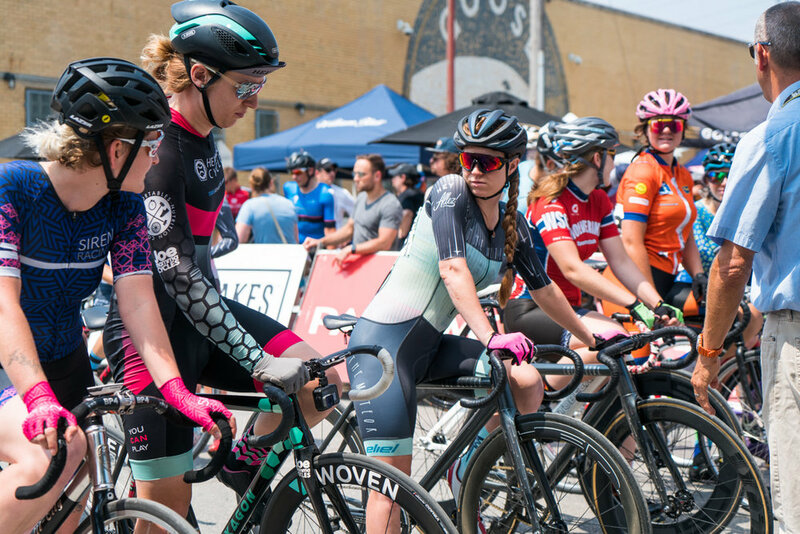 We got up in the morning, grabbed a bagel and headed over to the Fulton Street Market, home to the final stage of the Fyxation Open and the last day of partner series, the Intelligentsia Cup. The Fyxation Open is part of two great race series, the Tour of Americas Dairyland in Milwaukee and the Intelligentsia Cup in Chicago. This is the 5th year that we've partnered with the crew at the Intelligentsia Cup and we are honored to be a part of such a great event. Because of these great partnerships, our riders get to experience working with a world class crew that includes USAC officials, pace cars, motos, professional race announcers and many other perks. This year, the Intelligentsia Cup set up an expo area outside of the Goose Island Brewery and they invited Fyxation and our sponsors The Bike Lane, Chrome and Abus to attend. This was a great addition to the race as it created a fun environment for riders and fans to hang out and watch the races throughout the day. Goose Island Brewery was on hand serving beer, Intelligentsia Coffee was serving up cold brew and a number of food trucks lined the street creating an exciting atmosphere to watch the race. First up for the day, was the Fyxation Open Women's Race. The field was full of familiar faces and included a stacked field with riders from all over the US and even from Canada. The race got off to a fast start courtesy of the $200 cash prime that was offered on the first lap by our sponsor Abus. Once the Abus Hot Lap was won by Nicole Mertz, the riders settled in to a fast paced 30 minute race. The group stayed together most of the race with Omnium leaders, Nicole Mertz and Evelyn Sifton, sticking close together. Mertz and teammate Ash Duban knew that Sifton was right behind Mertz in the Omnium standings and they tried to repeatedly shake her during the race. When the riders rounded the final turn and headed into the quarter mile straightaway that lead to the finish, Mertz had a slight lead on Sifton and as they got closer to the finish line, Sifton dug deep and closed the gap. They crossed the finish line at exactly the same time and it was too close to call so we went to the monitors and Sifton had edged out Mertz by a few inches in a photo finish that was the closest and most exciting finish of the day. With the win, Sifton surged ahead of Mertz in the overall Omnium standings and took home the overall series championship and the amazing custom Chrome bag. Next up on the schedule was the Fyxation Open Men's race. The men's field was equally stacked and included riders from both coasts racing in their first Fyxation Open Omnium. Heading into the day, Brandon Feehery was in the lead, but the riders from Team Aventon, Fyxation Open Omnium veteran, Emile Abraham and newcomer and Mission Crit winner, Chris Rabadi, were close behind. After the Omnium leaders were called up to the line, the rest of the field found their place at the starting line and the race began. Abus generously donated a $200 cash prime for the first lap of the men's race and a grueling opening pace was set by the field hungry for the prime. After the men crossed the line at the first lap the USAC officials told us that they had just laid down the fastest lap of the day which is impressive considering they only had one gear! There was an early break in the field from Team Deluxe rider Daniel Spellman but after a short while out in front, the rest of the pack caught up with him. The pack would stay together during much of the race but with 10 minutes to go, David Santos from Team Aventon and Chris Rabadi from Team Handmade sprinted out in front of the group in a daring move. After a few laps at the front, their lead grew from 20 seconds to 30 seconds as it appeared that the field would let them duke it out for first and second on the day. As Santos and Rabadi, rounded the final turn they were neck and neck and they both dug deep in a final sprint that in the end was too much for Rabadi and Santos won the race by about 20 feet. The field was about 30 seconds back at this point and about 15 riders were neck and neck on the final sprint which was eventually won by Emile Abraham securing him a spot on the podium. Unfortunately for Omnium leader, Brandon Feehery, during the final field sprint his chain flew off causing him to be left in the road wondering about what might have been. We saw him after the race and as always, he had a big smile on his face and simply shrugged his shoulders and said "that's racing". We'll wrap up this mega blog post with a final thank you for everyone that made the Fyxation Open 5 possible. We can't believe how much our series has grown and we can't wait to show you what's in store. We're heading off to Denver on August 18th as we bring the Fyxation Open out west for the first time. In 2019 Denver will be an official host city for the Fyxation Open and we might have a few other venues added to the mix as well. Have a great year and we'll see you in 2019. Here are links to the Race Results, Image Gallery, Final Omnium Standings, Video Recap and our great sponsors.